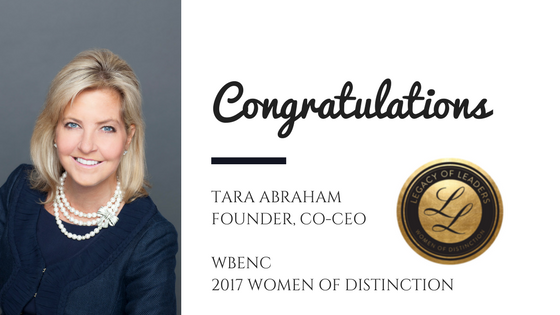 Tara Abraham Honored as WBENC Women of Distinction | Accel Inc. The Women’s Business Enterprise National Council (WBENC) proudly celebrates their 20th anniversary by recognizing an exclusive group of WBENC-certified women business owners known as the Women of Distinction. Our founder and Co-CEO Tara Abraham has been included as one of the 25 members because of her deep commitment to WBENC and to breaking down barriers for women owned businesses. Tara will be honored during the 2oth anniversary celebration at WBENC’s annual Summit & Salute taking place March 21-23 in New Orleans. Please join us in congratulating Tara for this well-deserved honor!